Stir fry flour in a large wok over medium heat until flour starts to turn yellow. Remove from heat and cool completely. Store in air tight container until ready to use. You need the fried flour for dusting the mooncakes only. Prepare pastry cream following recipe from Banana Cream Pie. Note: You will use only a small amount of pastry cream from the Banana Cream Pie recipe. So plan on using the remaining pastry cream for fruit tarts or just use 480g of durian flesh. Stir in the durian flesh until well combined. Divide into 8 portions, 60g each. 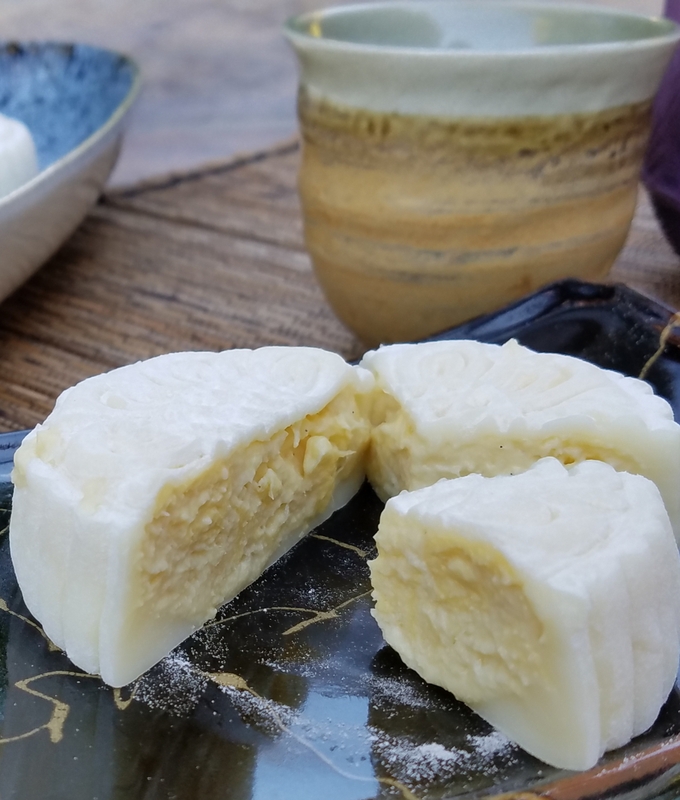 Wrap each portion into a ball using cling wrap and mold each ball into the shape of the mooncake mold. Store in the freezer until ready to use. Transfer from freezer to the refrigerator an hour before assembly so that they are softened slightly. Combine coconut milk, icing sugar, and oil. Set aside. In a separate bowl, mix glutinous rice flour, rice flour, and wheat starch. Stir milk mixture into the flour with a whisk. Strain the mixture once into a glass bowl and let mixture sit for 30 minutes. Cover the mixture with cling wrap and steam over high heat for 30 minutes. 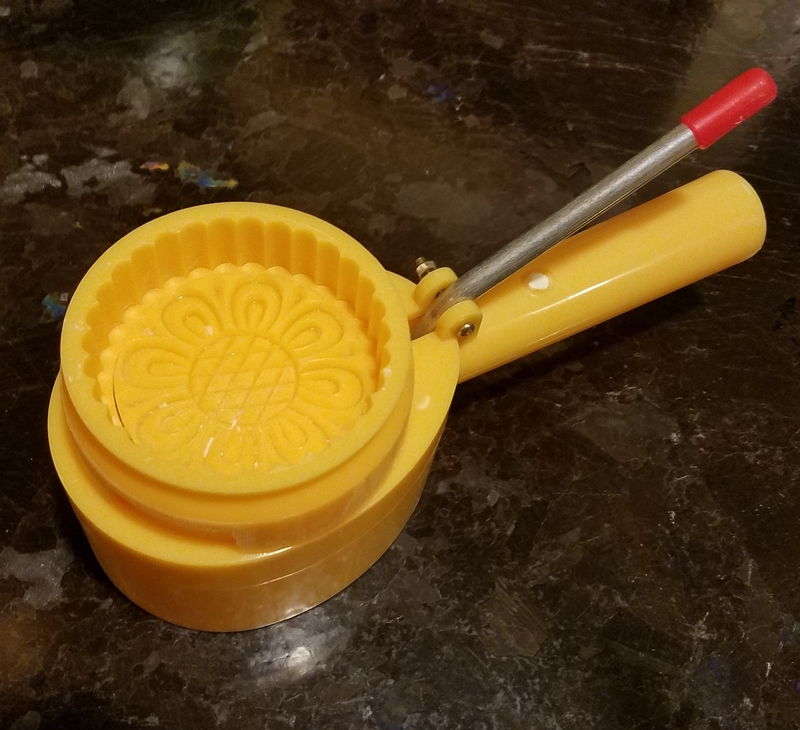 Mixture turns into a translucent dough. Remove from heat and stir the dough briskly with wooden spoon or chopstick. Cover your work top with cling wrap. Transfer dough onto cling wrap and knead dough until smooth. I wear a pair of food prep gloves and this makes the job really easy. The dough turned out just perfect. 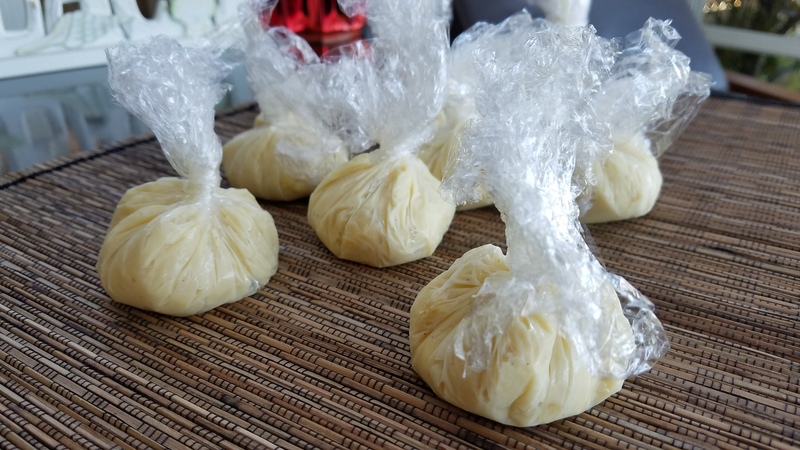 Wrap the dough in the cling wrap and chill in the refrigerator for an hour. Cover your work surface with plastic wrap and dust lightly with fried glutinous rice flour. 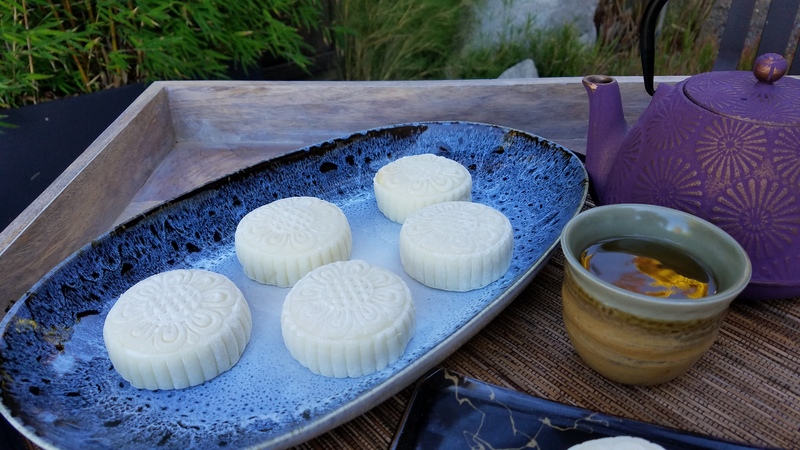 Dust the mooncake molds generously and set aside. Scoop a few table spoon of fried glutinous rice flour into a plate for coating the mooncakes. Divide dough into 8 portions, ~ 45g each. Flatten each dough ball into a disc large enough to wrap around the filling. 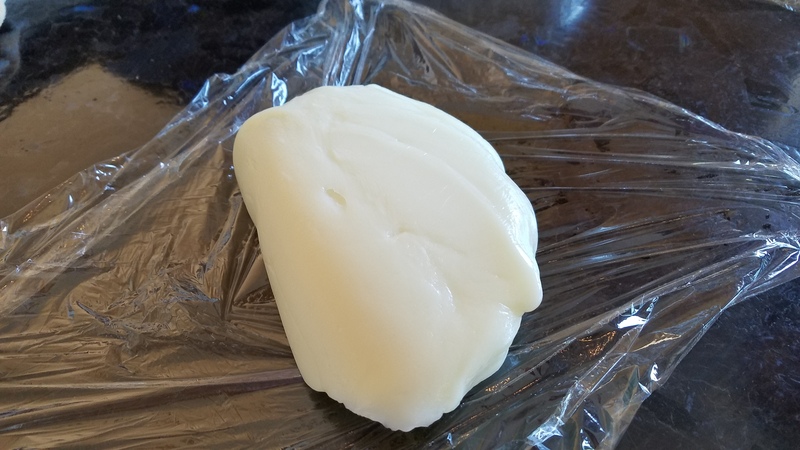 Remove the plastic wrap from the filling and wrap the snow skin around each filling portion. Seal completely and roll the mooncakes in the glutinous rice flour, shake off excess flour. Press the mooncake into the mold, unseal side facing the stamp. Unmold carefully and arrange neatly in a container. 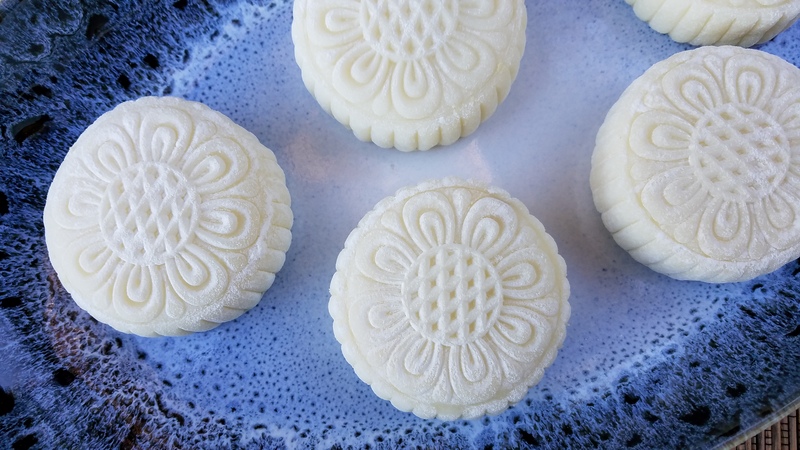 Freeze the mooncakes if they are not consumed immediately. An hour before serving, transfer from the freezer to the refrigerator.